THE BIGGET GIFT FOR YOUR NEW YEAR!!! 6.Applicable for automobile decoration, border or contour lighting. the connector between the light strip and IR receiver must be in towards the arrow .Please advise us if you have question. THE BIGGET GIFT FOR YOUR NEW YEAR!!! !The width of the strand is 10mm,Self-adhesive back tape for any dry and clean surface. 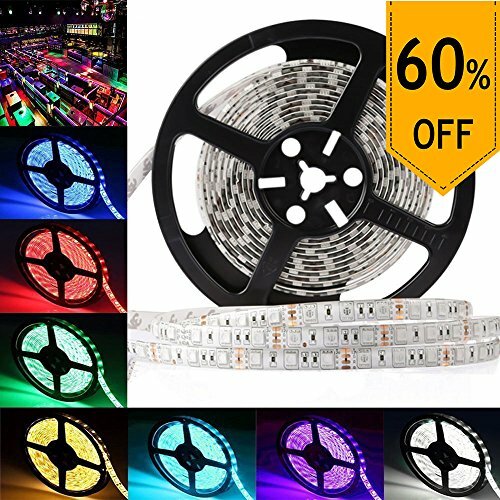 LEDMO have other more options for you: For a 16.4Ft/5M 300LEDs 5050 RGB Waterproof Full Strip Light Kit(include RGB remote controller and power adapter), please search ASIN " B014KXAMC8" on Amazon. If you have any questions about this product by LEDMO, contact us by completing and submitting the form below. If you are looking for a specif part number, please include it with your message.